Image caption Air Canada said it was investigating the incident and was "co-operating with the authorities"
An Air Canada flight with 140 people on board came within 30m (98ft) of other aircraft at San Francisco's airport as it prepared to land, a report says. Days after news that Flight AC759 from Toronto was involved in a near-miss it has emerged just how close it came to crashing into four planes on a taxiway. The incident on 7 July occurred after the pilot "inadvertently" headed for the area where jets were due to depart. He was ordered to pull up and the Airbus 320 circled and landed safely. As the plane approached the taxiway, which runs parallel to the runway, it is estimated that it flew just 30m above two aircraft waiting to depart, a preliminary report by Canada's Transportation Safety Board (TSB) said. After receiving a warning, the pilot pulled up and the plane rose about 60m above a third jet and about 90m above a fourth, the TSB said. Flight AC759 had already travelled almost 400m over the taxiway before aborting the landing, the board's report added. The pilot then made another successful approach. No injuries were reported. The flight was scheduled to land at 23:23 local time (06:23 GMT) but touched down at 00:11. An investigation into the incident by the US Federal Aviation Administration (FAA) is ongoing. The FAA described the near-miss as "very rare". 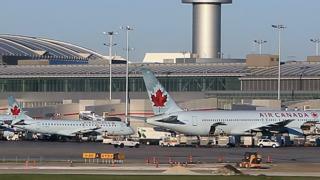 Air Canada said that 135 passengers and five crew members were on the flight from Toronto. It is not clear how many people were in the four planes on the taxiway. The taxiway, which provides lanes for aircraft to travel between runways and terminals for both landing and takeoff, is distinguished by different coloured lights. Earlier, an audio recording was released of what was said to be communication between air traffic controllers and pilots at San Francisco's airport on 7 July. In it, a male voice believed to be that of the Air Canada pilot is heard saying that there are lights on the runway. One of the air traffic controllers replies that there are no other planes there. Another - unidentified - voice is then heard saying: "Where's this guy going? He's on the taxiway." The air traffic controller then apparently realises the danger of the Air Canada plane crashing into the four aircraft on the ground, and orders the pilot to pull up and make another approach. A pilot from one of the planes on the ground is heard saying: "United One, Air Canada flew directly over us." An Air Canada spokeswoman, Angela Mah, said the airline was investigating the incident and was "co-operating with the authorities", local media report.